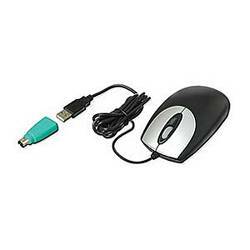 This 3-button optical scroll mouse is an outstanding value in a replacement mouse. The "built-to-last" micro switches are designed to endure over a million clicks and the clean symmetrical shape is comfortable in either hand. Includes PS/2 adapter. Pros: Works well, is comfortable, and provides good tactile feedback to clicks. It withstands the test of time and hangs in there for the long haul. Includes PS2 adapter so it can be used with virtually any system and is optical so it is mantinance free. Cons: It is a simple wired mouse without extra buttons and frills. Other Thoughts: I have used this mouse on my personal system for a couple of years now. It is reliable with no degradation over time. (No mushy clicks, no dimming of the LED. ).